A range of Artie Shaw big band arrangements made famous by the Artie Shaw Orchestra. Born Arthur Arshawski, was a clarinetist, composer and big band leader who had a string of jazz hits from the mid thirties to the mid fifties. He was reputedly a difficult man to work for and was a serious musician who preferred musical innovation and experimentation over commercial pop tunes of the era. Which of his famous charts would you know? Shaw and his orchestra had many hits including "Begin the Beguine", "Stardust", "Moonglow", "Frenesi" and "Nightmare". Many of his successes were down to the arranging skills of Jerry Gray who would go on to write and arrange for the Glenn Miller Orchestra. 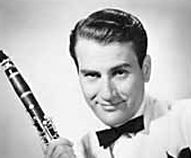 Artie Shaw employed vocalists such as Billie Holiday, Mel Torme and Helen Forrest, who also sang with the Benny Goodman Orchestra. He also formed a smaller band, the Gramercy Five, which only pressed eight records and had one hit with "Summit Ridge Drive". He retired from the jazz world in 1954.